The primitive walls & flats (primwalls, primflats) added to Alphaworld in February of 2008 were built to be an organized and simple system to replace the current basic building wall set. The naming may look confusing at first glance, but it is actually a very organized and well thought-out system. For the entire list of object names for the primwalls and flats, see the Primitive Wall/Flat List. The primitive wall prefix w is present on every wall type object. This part never changes. Modifies the the way the object tiles a texture. Available for all object types. Applies a 1m x 1m texture map. Denoted by default green tile texture. Applies a 2m x 2m texture map. Denoted by default white tile texture. Applies a 4m x 4m texture map. Denoted by default blue tile texture. A three character name that specifies the type of object. Separates the Object Type Name and the Primary Dimension Modifier. 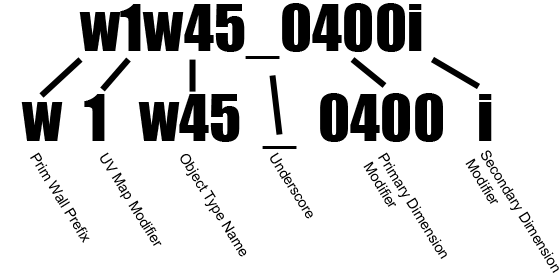 Some Object Type names contain numbers, which can be really confusing if pressed up against the 4 digit Primary Dimension Modifier. Specifies the object's width. Unlike the Secondary Dimension Modifier, this is only required for some of the Object Type sets. c45, p45, t45 and s45 do not require this modifier. Specifies the length or height of certain object types. All sets require this modifier. Next we will look at the primflat naming convention, which is much more simple. The primitive flat prefix flat is present on every flat type object. This part never changes. Works the same way as the primwalls; modifies the the way the object tiles a texture. Specifies the type of flat. Separates the Object Type Name and the Primary Dimension Modifier. Keeps theme with the primwall convention. Specifies the length/width of the flats. Special Case: When using the i or j dimension modifier with a Concave/Convex Curve, you can add a 2 to the end to get another curve thickness.